We all know we “must eat our greens" because they are low in calories, high in vitamins, minerals, antioxidants and fibres and make us strong like Popeye. This is the season of greens and they can be seen in every market, lusciously strutting their stuff. From mustard leaves, mint leaves, turnip greens, spinach and fenugreek leaves to Malabar spinach, amaranth leaves, fennel leaves and Swiss chard—the greens are in full bloom. Some enjoy their winter greens, having grown up on them. For others, however, eating them is a chore—something that must be done because they are nutritious. In some cases, it can be as bad as having medicine. So greens are added to dals, cooked as saag dishes or used in salads, their existence disguised on occasion with loads of onion and masala. It needn’t be this way. If you understand the flavours and texture of each leafy vegetable, then you can use them in meals with much more confidence and gusto. And yes, enjoy them too. Cook the onions with the oil in a medium-size pot for 4-5 minutes until slightly golden and translucent. Add garlic and the fenugreek leaves and cook for another 2-3 minutes. Pour in the vegetable stock and simmer for 10 minutes or until the stock has reduced to three-fourths of its volume. While the stock is simmering, grind the cashews, yogurt, salt and pepper with a hand blender till it forms a smooth creamy consistency. Mix the yogurt blend to the stock on low flame for a couple of minutes to warm up the mixture. Serve hot. 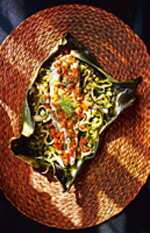 Something fishy: Baked Fish Fillet with Fennel Leaves. Separate the fennel leaves from the bulbs and chop them individually. 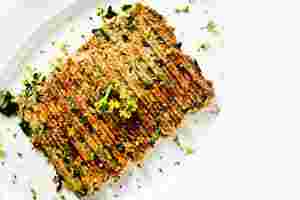 Heat 1 tbsp olive oil in a medium-size pan and add the chopped fennel bulbs, fennel seeds and sliced green pepper. Stir on medium heat for 3 minutes. Take a large bowl and mix the red bell pepper, fennel leaves, lemon, sugar, salt, pepper and remaining olive oil. Rub gently on the fillet. Take a baking tray and oil the base. Place the cooked mixture on it, and the fillet over it. Pour any remaining liquid over the fish and pop it into an oven, pre-heated at 200 degrees Celsius, for 15 minutes. Serve hot. Peppery flavour: Broiled Chilli Mustard Greens and 7-Grain Flour Kookoo. Heat the butter in a medium-size pan on medium heat. Add the mustard greens, spring onions, green chillies and mustard seeds and cook gently for 5 minutes till the ingredients are soft and the mustard greens have reduced slightly in size. Take a large bowl and mix in the 7-grain flour, milk, eggs, salt and crushed peppercorn thoroughly. Add the cooked greens to the bowl and mix well. Pour the mixture to form a flat pancake on a pre-heated toaster or stove grill on medium to high temperature. Let it cook for 4 minutes on an open grill. Flip the side and cook for 2 minutes more. Garnish with the yellow mustard flowers and serve hot. 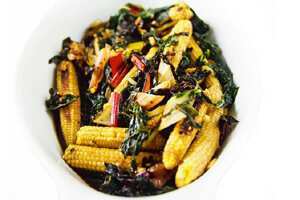 Crunchy delight: Ginger-Honey Braised Swiss Chard with Babycorn. Heat the oil in a medium-size pan on high heat. Add the babycorn and cook for 3-4 minutes, then add the Swiss chard and cook for another 3-4 minutes, stirring occasionally till the vegetables are slightly charred and release a smoky aroma. Lower the heat to medium and add the remaining ingredients. Simmer for 3 minutes and remove from heat. Serve as a side dish with rice or noodles.